From the moment of their inception, some films are simply destined to become legendary in one way or another and Marlon Brando’s sole directorial effort had legend stamped on it from the get-go. Based on the book The Authentic Death of Hendry Jones by Charles Neider, the film’s first script was written by a young up-and-coming writer named Sam Peckinpah. It was subsequently re-written by Calder Willingham and then Guy Trosper. After viewing a movie called The Killing, Brando hired its director, Stanley Kubrick. By the time the film went before the cameras, Kubrick was gone and Brando was not only starring, but also directing. While the end result might not be to everyone’s liking, the fact is that the finished film is oddly compelling, poetic, and sometimes completely bizarre, and fully deserving of its legendary cult status. The film looks gorgeous – it was the final film made in Paramount’s brilliant process, VistaVision, and the great Charles Lang was the director of photography. The cast also included Karl Malden, Katy Jurado, Ben Johnson, Slim Pickens, and the supremely weird Timothy Carey. There are some truly great scenes and some eminently quotable dialogue (“Get up off the floor, you scum-sucking pig”). But what gives the film a great deal of its luster and brilliance is the score by Hugo Friedhofer. 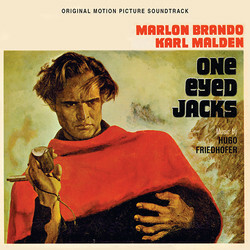 Sometimes the stars are magically aligned and a composer gets a perfect project, one that plays to all his musical strengths – Friedhofer’s music elevates One-Eyed Jacks in every sense – it’s passionate, beautiful, exciting, dramatic, luminous – and one of Friedhofer’s greatest achievements, in a career filled with them: The Best Years of Our Lives, The Bishop’s Wife, The Rains of Ranchipur, This Earth Is Mine, The Young Lions (also with Brando), The Harder They Fall, Vera Cruz, Soldier of Fortune, Seven Cities of Gold, Violent Saturday, Hondo, Rancho Notorious, Broken Arrow, and the list could go on for several more pages. One-Eyed Jacks was originally released on LP by Liberty Records. Friedhofer had all the scoring masters available to him and from these he prepared the album release (any thoughts of a 2 LP set vanished when the film did not perform at the box office). Obviously because of LP time restrictions, less than half of Friedhofer’s amazing score was on the album. On CD 1, we present that original album program, remastered from the original two-track album masters, along with two alternate cues from the full score. Note: On our original release, there was a mistake on the “Alternate Main Title”, which was actually from The Jayhawkers and not by Friedhofer at all. For this release, we were thrilled to find there actually was an alternate main title and we’re happy to include it. On CD 2 we present Friedhofer’s entire score in all its magnificence, in pristine stereo sound. To hear this score complete is a revelation – and for Friedhofer fans and any fan of great film music, this 2 CD set is a must-have. The booklet features great liner notes by Nick Redman. The original release was a very quick sellout and this has been one of the most requested titles for us to reissue and so we’re happy to make another 1000 copies available to those who missed out the first time.